Edward de Vere was born into a world that had remained more or less the same for six hundred years, held in fee by his ancestors, descendants of the Norman knights who invaded Saxon England in the late 11th century––but it was a world whose time was fast coming to an end. Local history has it that de Vere first saw the light of day in a nunnery in the little town of Castle Hedingham within view of the hilltop castle keep for which the town is named. Since history tells us only that whatever nunneries there may once have been there would have been shut down by the time he was born, either one escaped history or he was born somewhere else nearby. Hedingham Castle still stands at the center of what was once the Oxford earldom, a vast domain that in the mid-sixteenth century stretched for hundreds of miles on every side, encompassing thousands of acres of “Constable country,” woodland, field, meadow, and roads that passed through towns and villages throughout East Anglia. 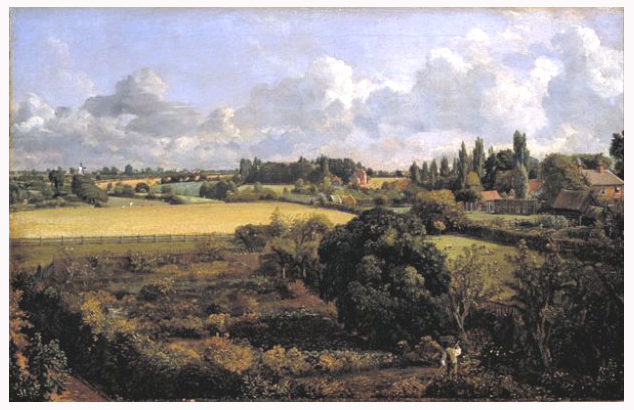 It’s called “Constable Country” today because it was painted so often by the famed English landscape artist, a descendant, in fact, of the Goldings, Edward’s mother’s family. We should keep in mind the fact that Edward was only half an aristocrat. Although his father was the scion of a crumbling 600-year-old dynasty, the 16th in a line of earls that went back to the Norman conquest, his mother, Margery Golding, was only the sister of a local squire, a fact that should be kept in mind when charges of Oxfordian snobbery arise. Their marriage had been arranged, or at least facilitated, by her older brother, Thomas Golding, a man on his way up in the brave new world of Protestant politics. Margery (or Margaret) was the earl’s second wife (the first, a blueblood Neville, had left him shortly after bearing him a daughter). Most unusually for his time, Edward would be the Earl’s only son. A daughter was born a year or two later, probably in a try for a second son, but there would be no more children. It is not known where the boy lived for his first four years, but it was probably either with his mother’s family at his mother’s childhood home of Bloomsters, due to the turbulent times and the need to keep the earl’s heir safe from his enemies. Standard practise among the nobility since the middle ages would have him with a caregiver until he was weaned, probably at about two (Stone 81, 428) and, considering the chaotic times, quite possibly for the next two years as well. Since he had no brothers and but one younger sister, it’s unlikely that a nursery was established where his parents lived (close to the present 11th-century castle keep, but certainly not in it). As the busy center of an immense political fiefdom, this would have been more like a modern hotel than what today we would consider a home. In such an establishment, no one, not even the Earl or his Countess, had any privacy (Stone 4, 6-7) or any real security. Fear of infection and political enemies would have caused the Earl and his steward (his brother-in-law Henry Golding) to see that the precious heir was as safe as possible from possible harm. The summer before Edward’s birth, all East Anglia was rocked by violent uprisings, one located a few miles north at Lavenham, Suffolk, the administrative capital of the Oxford earldom. This was not one of those old-fashioned summer wars that in feudal times sprang up between war lords and their factions with the flowers every spring and, like the foliage, went dormant in the winter, but a nation-wide grass roots rebellion that erupted spontaneously in several different locations at once. Laborers, artisans, and farmers, upset by the enforcement of the Reformation church service and enraged by skyrocketing prices, food shortages, and the increasing enclosure of common grazing land––burnt hedges, took hostages and demanded reform. During one of the battles, the Earl’s ward, Ld Edmund Sheffield, fell to one of the rebels. A butcher by trade, the man––who either didn’t know he could get a considerable ransom for a lord or else was so worked up he didn’t care––beat the young poet to death, leaving Earl John’s sister Anne a widow. While England was burning, Protector Somerset, so triumphant at the Battle of Pinkie Cleugh two years earlier, now seemed at a loss, so when his fellow Privy Councillor, John Dudley, Earl of Warwick, successfully––and with classic 16th century cruelty––crushed the rebellion, it became Dudley’s first step towards his overthrow of Somerset a few months later. Born mere gentry, the Duke of Somerset (aka Earl of Hertford, aka Lord Seymour) had skyrocketed into the peerage when his sister, Jane Seymour, Henry VIII’s third wife, succeeded in providing the King with the heir he was so obsessed with getting. Somerset showed strength in ushering in the Protestant Reformation along with a bloodthirsty rapacity towards those members of the ancient nobility who had treated him with disdain before his rise to power. Having successfully robbed and crushed the Norfolk earldom (Williams), he had just turned his greed towards the Oxford domain when the roof fell in on him. Earl John, frightened by what had happened to his Howard allies, had cravenly agreed to marry his son (if he ever had one) to Somerset’s (infant) daughter––basically, signing away his patrimony––when the Protector’s fall put a stop to it just in time. Parliament quickly voted to rescind the illegal agreement, and the Oxford earldom was secure again, though not for long. Three years later, with the poor young king dead at fifteen of some grossly fatal disease, a nation nostalgic for the good old days turned to his older sister, Mary Tudor, the daughter of Henry’s first queen, the Spanish Katherine of Aragon. Dudley (aka Warwick, aka Northumberland), rightly fearful for his neck should a Catholic take control, finagled to put his hapless young daughter-in-law on the throne. Earl John, eager to stay out of trouble, signed the letters patent that declared Lady Jane Grey Queen of England, yet when push came to shove at Hedingham Castle, the Earl’s estate workers rose in unanimous indignation and forced him to endorse Mary instead. This was enough for the fearful (irresolute? crazy?) Earl. Standing by while a hundred of his servants––all, according to Wingfield, “remarkable for their stature and strength”––locked up Northumberland’s envoys, including his own brothers-in-law (Sir Thomas Golding and his steward, Henry Golding), Earl John then set off with the insurgents to join the army of Mary’s supporters at Framlingham, fifty miles from Hedingham, who were gathering in preparation for the showdown with Northumberland. It is not known where the three-year-old heir was during this fracas, presumably safe somewhere and aware only of an atmosphere of noisy excitement, if anything, but the events of that day would have a lasting effect on his life and development. Religious beliefs played a part in this scenario, of course, but less perhaps than assigned by historians. Wingate was a Catholic, as no doubt were most of Oxford’s retainers, while the Protestants who sided with Northumberland claimed the Goldings and Earl John himself. Nevertheless, among all but the most committed Protestants, loyalty to three generations of Tudors would trump all else. Northumberland was overcome, Mary Tudor was placed on the throne, church bells rang once again throughout a nation eager to return to the traditional church service and its annual round of May Games and Church Ales. Meanwhile all through Essex, Sussex, Suffolk and Kent, the more adamant reformers, those with no appetite for martyrdom, set sail for the Continent. As for Earl John, despite his decision to back Mary Tudor, he would never be trusted by her regime. All the European cities where militant Protestantism was most strong––Antwerp, Geneva, Frankfurt, Wittenberg, Strasburg––were most easily accessed by boat from the shores of the Oxford fiefdom. With a store of arms in his castle, and his known patronage of John Bale, whose polemics were an ongoing torment to the regime, the Earl was under continual observation. Mary was inclined to be merciful, but as soon became apparent, she was all too pliable to the will of her husband and his advisors, who had no pity for heretics. Although the nation at large may have welcomed good King Harry’s “legitimate” daughter and the restitution of the familiar Mass, once the new queen made it clear that she intended to marry Philip of Spain, the national mood began to shift. A return to the Old Religion was one thing––but to willingly bow down to a foreigner, particularly a Hapsburg, the son of Charles V, Holy Roman Emperor, and soon to be King of Spain, was something else again. When in December 1553 Spanish envoys arrived to arrange the wedding, they were pelted with snowballs by schoolboys and with scurrilous ballads sung by the citizenry. Although the marriage agreement had been signed by December, young Philip, who was obviously far from enthusiastic about his aging bride-to-be, continued to stall, not arriving in England until the following July. Once married, thoughout the summer and fall of 1554 the royal couple and their courtiers seemed more interested in hunting, feasting and dancing than stamping out heresy. But with the arrival in November of the Pope’s legate, Cardinal de la Pole, followed by Parliament’s acceptance of Mary’s proclamation that England was again officially a Catholic nation, subservient to the Pope in Rome, the regime began to show its true colors, such that would leave the Queen dubbed “Bloody Mary” ever after by an unforgiving history. On the Sunday following Advent, High Mass was celebrated once again in full panoply at Paul’s Cathedral where hundreds gathered to hear her Lord Chancellor, Stephen Gardiner, beg God for forgiveness for England’s great sin of heresy during her brother’s reign. Thus seemed undone two decades of government and church reform. she scraped her tripe, lick thou the knife. The miller of course, was Philip and his wife was Mary. No one yet had had his tripes scraped, but all knew, and feared, what was coming. And they were right––the burnings began in March. Essex towns became centers for the martydom of dozens of Protestant evangelists of all degrees, both high and low. As detailed by John Foxe in his book of martyrs, they were rounded up, jailed, grilled, and humiliated by William Bonner, Bishop of London, and the Protestant turncoat Sir Richard Rich, then burned at the stake in Chelmsford, Stratford-at-Bowe, and other locations in Essex. The “burnings” continued throughout the five years of Mary’s reign. It takes no great effort to imagine just how festive the reformers were feeling that winter holiday season of 1554-55. Wyatt’s Rebellion had come to nothing but serious losses for leading Protestants. Prince Philip, backed by his father, the Holy Roman Emperor, was––if not yet officially, no doubt soon to be––King of Spain, while England was now once more, by official fiat, a Catholic nation. The international repercussions were almost as disturbing. Scotland was still tightly controlled by the Catholics under Mary of Guise (mother of the young Princess Mary, the future Queen of Scots), while the advent of Philip was certain to turn the French, Spain’s greatest enemy, into an active encroacher. Most worrisome perhaps to the Protestant leadership may have been the danger from within their own ranks where hotheaded English Robespierres and Thomas à Beckets were contemplating actions that could easily provoke an all out civil war. Dreading what was to come, many reformers rented their houses or closed them up. Hundreds set sail for the Lowlands, Germany or Switzerland, where Protestants were, if not in control, at least tolerated. It was at this time, December of 1554, that the former Bishop of Lincoln, the reform cleric Dr. John Taylor, died at Ankerwycke, the home of his former student and old friend, Sir Thomas Smith, and also that, according to Smith’s biographer, the four-year-old Edward de Vere was brought to live and be tutored by Smith. This makes everything so much clearer, bringing understanding to a period cloaked in the fog of time for most of us. Thank you for this amazing blog, and for the information you share with us.